Alphabet Ideas: The Letter A Activities! WHAT WE DO - BODY: We chose our Arms as the body part for A week. We did simple exercises with our arms (the hokey pokey worked well) and worked on telling which was our right arm and which was our left arm. We also counted all the kids' arms and all the parents' arms. Then Tasha got to add the kids' arms (4) + the parents' arms (4) = 8. The girls' arms (6) + the boys' arms (2) = 8. For younger kids, just counting them would suffice. 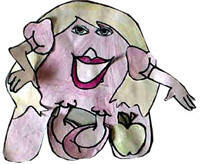 WHAT WE DO - CRAFTS: Instead of colouring or painting a picture, why not try apple printing it. Lie an apple on its side and cut it in half. The core will make a star shape. Dip the cut end in paint and "apple print" a picture. You can use apple prints around the edges of a piece of construction paper as a frame for Angie A or the Awesome Apple crafts listed above. You can also Apple print our letter A-a template to help reinforce the letter shapes. WHAT WE DO - FOOD: Well, it may be the stereotypical American dessert, but Canadians love it too. During "Aa week" why not make an Apple Pie with your kids. For those of you who have lots of time and cooking talents, you can make scratch dough (kids love mixing and rolling!)... while they work on the dough, you can chop apples. Or for those of us who don't have quite so much time or skill, go shopping with your kids for a pre-made pie crust and a can of apple pie filling. The kids can dump the can in, smooth it around and put on the top crust (now that's my kind of pie! *grin*). Some other Aa food ideas include angel food cake, animal crackers, apple juice, apples, apricots, asparagus, and avocados.